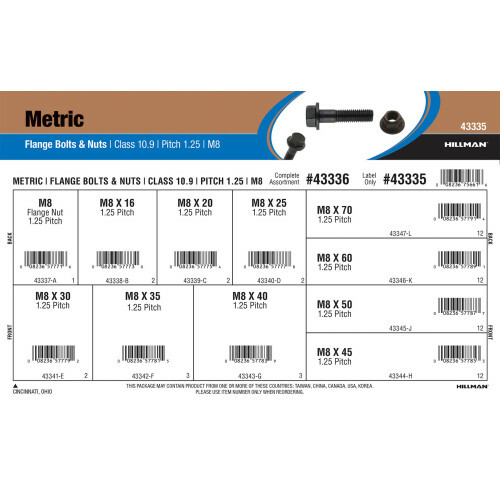 An assortment of class 10.9 metric flange bolts & nuts from The Hillman Group. Flange bolts are one-piece hex washer-head bolts with a flat bearing surface. The flange eliminates the need for an additional flat washer. Flange lock nuts are one-piece, all-metal prevailing torque hex nuts. They can be screwed onto the end of a flange bolt to create a secure, closed fastener. Variants included in this assortment feature a coarse M8-1.25 screw thread and run 16mm thru 70mm in length. Full assortment contains eleven (11) refills comprised of Hillman item numbers #43337 - #43347.